Scientists from the U.S. Geological Survey predict that two thirds of the world’s polar bears will disappear in the next 50 years because of declines in Arctic sea ice. But those dire findings don't seem to be lighting any fires under those making decisions about how to protect the majestic animals. The U.S. Fish and Wildlife Service was required to finalize its decision to list the polar bear as a threatened species by January 9 of this year. As CNN reported earlier this week, Fish and Wildlife Director Dale Hall admitted his agency had missed the deadline, in an effort he said, to be thorough. That was January 17. Now the Senate Committee on Environment and Public Works wants some answers. Senator Barbara Boxer, (D-CA) who chairs that committee, is requesting that Secretary of the Interior Dirk Kempthorne (Hall's boss) appear at a hearing next month to answer questions about the continued delay. "It is time for the Interior Secretary to answer questions about the administration's continued foot-dragging on the polar bear listing. Secretary Kempthorne must explain to the American people why his department has failed to follow the law and why they still haven't issued a final decision to protect the polar bear," Boxer said in a statement from the committee. Will Kempthorne show up? In an e-mail, his press secretary told CNN: "The Secretary has a great deal of respect for Senator Boxer. We will respond to the Senator's request in a timely manner." 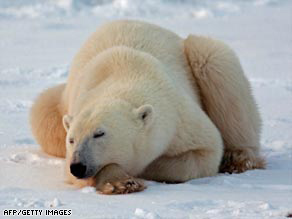 Perhaps complicating polar bear habitat issues, Interior officials have moved forward on approval of $2.7 billion in oil and gas leases in the Chukchi Sea. That area between Alaska and Siberia is home to about twenty percent of the planet's polar bears. Antarctica is colder and at high elevation, gale force winds and very little precipitation. No plants at all except for a few lichens that live INSIDE the rocks! Polar bears would not have food, and would probably freeze to death in the winter! If they did survive they would be an ecological disaster. Frankly the arctic is a vacation paradise by comparison. If the organisms really adapt to environment according to the rule stated by charles darwin theory of evolution, then why dont they survive now under extreme conditions?????? So, what if the pollution levels really raises up to the extremity, will we able to survive in this god gifted planet???? Individual organisms have limited adaptability to environmental changes. In the case of the polar bears, the decrease in ice cover means that they would have to swim possibly hundreds of miles to find ice for resting and hunting, instead of just a few miles. An individual polar bear may be able to increase its endurance somewhat, just like a trained human athlete, but an increase from 10 miles to 200 miles is probably impossible and certainly difficult enough that very few bears would be capable of doing so. Evolution refers to the changes in the genetic makeup of a *species* over a period of generations, as the surviving individuals pass on their successful genes. The current changes in the Arctic (and elsewhere) are occurring too quickly for evolution to keep up. It would be nice that Polar Bears were left alone and not killed for their fur. We can't stop Mother Nature, we never have, so why all the hysteria that humans are killing Polar Bears!? This so called " global warming" (although this winter was one of the longest and coldest I've ever endured) is a natural trend through out earth's many years. Humans are not the cause of global warming! Watch the movie "The Great Global Warming Swindle" done by the BBC news network. Thanks Barbara Boxer for wasting taxpayers time hounding some guy with the Enviorment and Public Works organization! I am sure a scathing is really going to help. Polar bears are good conservers of heat. Likely able to hibernate, after digging into a snowbank. Being very adaptable, could they find enough during the Antarctic summer ? Your next-to-last sentence should be the lede. According to this morning's newspapers, the Bush Administration has systematically and deliberately slowed down, impeded, and thwarted the process of protecting endangered species, including overriding the recommendations of its own scientific staff, precisely in order to allow rapid exploitation of animal habitats. This isn't an accidental happenstance. It's the whole point: Do what's best for the corporate interests (your campaign donors and lobbyists), to heck with the environment. And to heck with faithfully executing laws duly enacted by Congress, and abiding by court orders that have slammed the administration on this point. Good God...........don't you people have jobs to go to? I think saveimg the bears is a noble cause but I'd rather hav a bunch of electric heavy equipment thn a pet polar bear. Funny how the Senate is suddenly worrying about the polar bears/habitat when 3 of their own group, McCain, Obama and Clinton are flying multiple jet airliners across our country on a daily basis with absolutely NO regard for the toxins each plane is sending into the atmosphere or how much the fuel costs! Shot the bears, get the oil. Do the right thing, reduce the price of gas soonest. I think a seeding project is in order, collect several samples of sperm and eggs from the polar bears and preserve them so that when the environment stabliizes again, we can re-introduce polar bears into the arctic and help them propogate. A good polar bear is a dead polar bear. More bear means more political activist, tree huggers etc ..etc. leverage etc. No bears = worries ..and more profit from the Chukchi Sea. This is the tip of the Iceberg. As resources dwindle ..their values will rise and those in the bussiness will profit well. YEAH!! God bless america :heres her 30 pieces of silver. I think that all the polar bears should just go kill themselves! I mean everyone talks about them behind their back all the time. Would you like that? I have a bunch of bombs and i dont know what to do with them! The problem that people just aren't getting is that carbon dioxide absorbs HEAT. Look no farther than Venus to see why this is true. Venus atmosphere is 900 degrees at the surface, and this is because of a thick atmosphere of 95% CO2. We are adding more and more CO2 to our thick atmosphere which will increase the percentage and warm our planet significantly. Carbon is key, and that is why we are losing the battle in global warming. Until transportation and manufacturing make significant differences in reducing their carbon emissions, it will only get worse. If you live by the coast or a river, you might want to think about moving soon.